What’s Stace doin’ now? 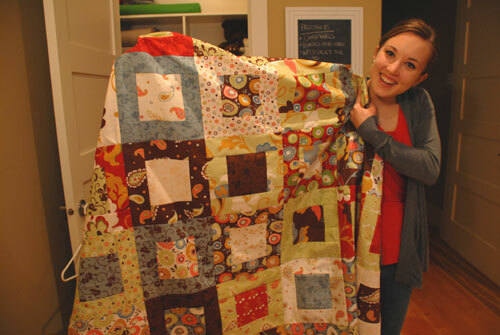 She’s got lots of projects, ranging from creative, modern quilts to functional fashion and gift ideas for all. What does a twenty-something like? I’m in love…with a new tool! We picked up the Flip Flop Ruler at Fall Quilt Market and it’s perfect for beginners, quickly makes a quilt entirely out of scraps, and is ADDICTIVE. I’ve already incorporated making these blocks into my scrap-management system. Here’s the blocks I’ve made so far. What do you think? 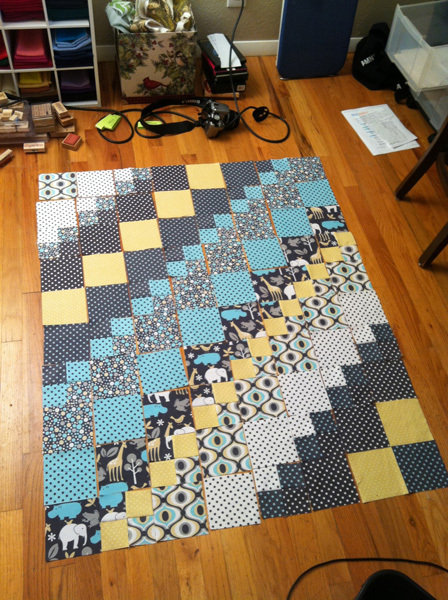 The ladies who created the ruler jokingly call this style the “stuff off mom’s sewing-room floor” quilt. Keep your eyes peeled for an in-detail demo soon. It’s been a year. Can you believe it? I’ve been working at the quilt shop and learning this quilting stuff for a full year. It’s gone by too fast. I would have expected to consider myself beyond a beginner level after a year, but somehow I’d say I’m still pretty new to the actual nuts and bolts of sewing. I haven’t even gone beyond making squares. But, hey, let’s give me a break. With work, a dog, planning a wedding and buying a house this summer, I’ve been pretty busy. 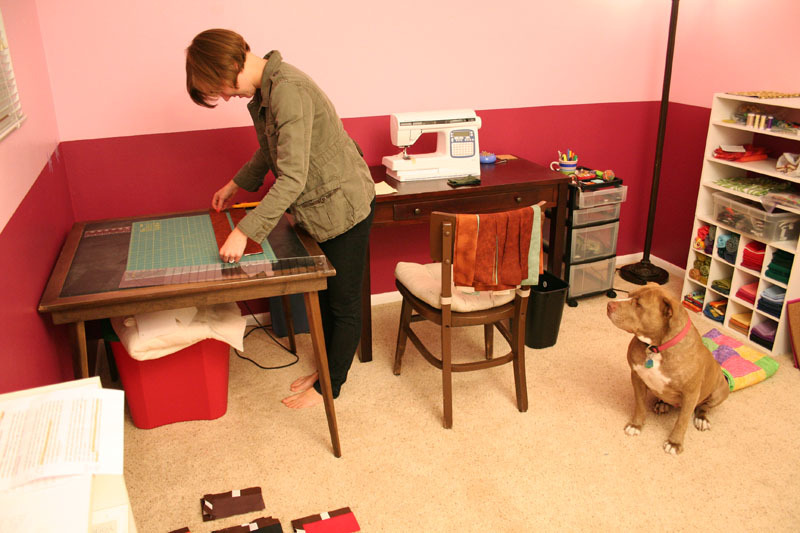 But I’m back in the game as I finally unpacked my sewing room last weekend. Granted, it’s still painted two-toned magenta shades courtesy of the six-year-old girl that occupied the room before me, but at least I’ve got all the required stations in place. Give me another three months (that’s about the speed I’m workin’ at these days) and I’ll get around to making it feel like my own space. In the past year, I’ve worked on a few quilts: my first quilt from a layer cake (that now migrates between my couch and bed at home), two shop samples that are hung very, very high on the wall to hide the shameful sewing I did, and a few unfinished projects that bounce back and forth between active on my sewing machine and being “on deck.” I can thank my poor attention span for all the back-and-forth! Here's all my "on deck" projects....will they ever get finished?! Look familiar? 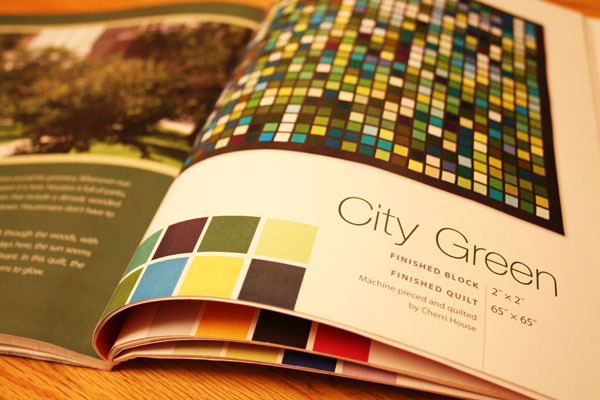 Yup...those are some blocks from City Quilts "City Lot." After sewing my sashing with WAY, WAY TOO BIG seams, every block has been an angry battle to complete. I'm just aiming for "finished" sooner or later. It will be goofy. It will be donated. And that's just fine by me. If you can remember, I made quite a fuss about one of the store samples I made needing to be perfect, but in retrospect, the pressure of making a store sample does not compare to my current projects — quilts as gifts. I know that one of the joys of quiltmaking is planning a project with a very special person in mind. However, TALK ABOUT PRESSURE! The first gift quilt I planned was for one of my nieces. She is turning three this Halloween. So, really, she doesn’t care what the quilt looks like, but I DO. It had to be perfect. After a few days of restlessly cruising our patterns, I decided to give up. It was useless. No matter what I chose, I would never feel it was perfect. So I just went home, chopped up a few fat quarters and sewed them together. It’s basic, but it’s done! One of our mottoes around here is “better done than perfect” and I think I learned my lesson. I am just finishing up that quilt for her birthday present this year. Look familiar? I used it for our Binding Blog photos. Wonder where I get my love for animals from? 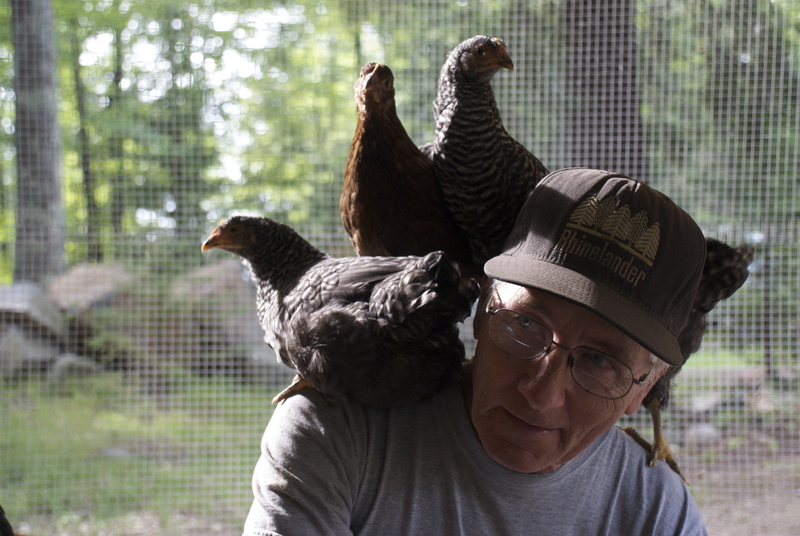 My dad raised these chickens from when they were chicks. They loved him! Even with the pressure off on the actual sewing, I still felt the fabric and pattern needed to be tops. My dad is retired and is lucky to live in a beautiful lakeside cabin in Northern Wisconsin. He spends his afternoons in his rusty old rowboat, fishing on the lake. My mom has the house fully decorated with all kinds of Northwoods details — bear figurines, “gone fishin’” signs, and even a wooden raccoon hanging off the side of the house. They’re cabin people. I knew my dad’s quilt would need to fit my mom’s decorating as well as my dad’s interests. BINGO! 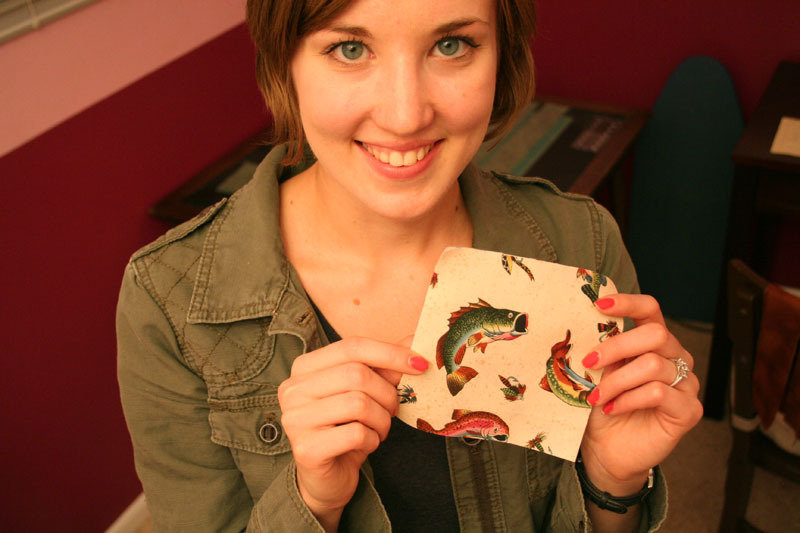 We have trout fabric. I’m mid-project and am excited about how it’s turning out. I’m using one of our free patterns meant for a layer cake. It goes together pretty quick and really features the fish fabric. When I get around to finishing the top, I’ve got plans for some fish-quilting and cozy minky on the back. Northern Wisconsin gets wicked cold in the winter and I’m sure there’ll be nothing better than warming up by a fire under this quilt with my dad. Phase 1. I cut all my fabric and matched my "centers" with my "borders." It's kind of hard to believe this small stack of fabric will eventually spread out to make a whole quilt top! Phase 2. Half of my "borders" sewn to my "centers." My fiance was at a hockey game, so there was NOTHING to distract me from making serious progress on this project. Onwards! Phase 3. PEOPLE! 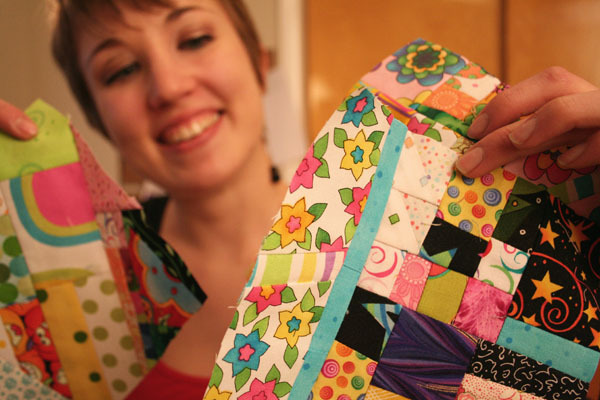 I am not a fast sewer, but I think I had Della's wind beneath my wings as I was sewing these blocks. I cut all my fabric and sewed ALL my blocks in the same night. It's kind of a record for me. I think I'll go ahead and give myself a little pat on my back. The hardest part, as always, was strategically arranging all my blocks while deterring my curious dog from laying right on top of everything. P.S. I was foolish to think this would be my last gift-quilt for a while. I recently got the news that BOTH of my older brothers’ wives are pregnant. And here’s the kicker — one of them is having TWINS. Looks like I’ve got three sets of baby quilts and baby gear to whip up before next summer. Any suggestions to get me started? 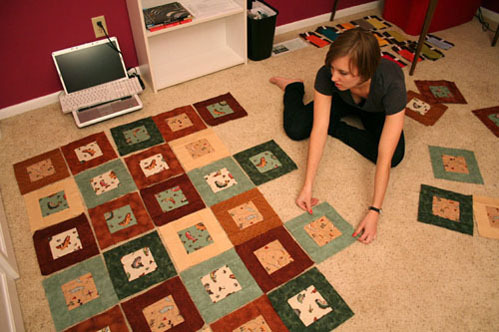 What are some perfect quilts you’ve made for your special people? Confession time. As much as I would like to believe otherwise, I’m not the greatest sewer. There. I said it. As a beginner quilter, you would think this shouldn’t come as a shock to me, but it does. 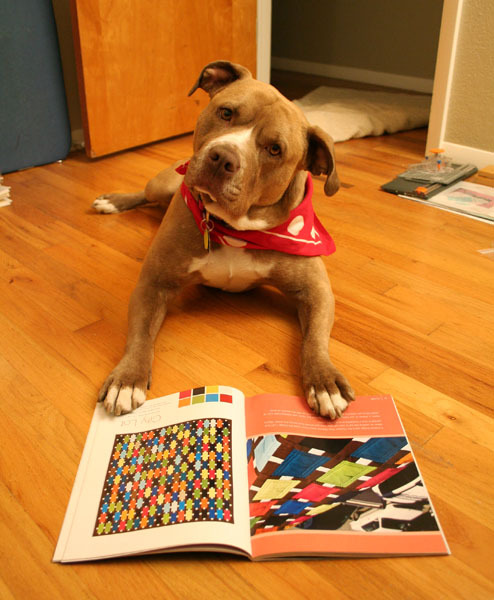 You see, I’ve learned a lot about sewing over the last nine months of working at the quilt shop. I hear customer questions and our expert answers every day. 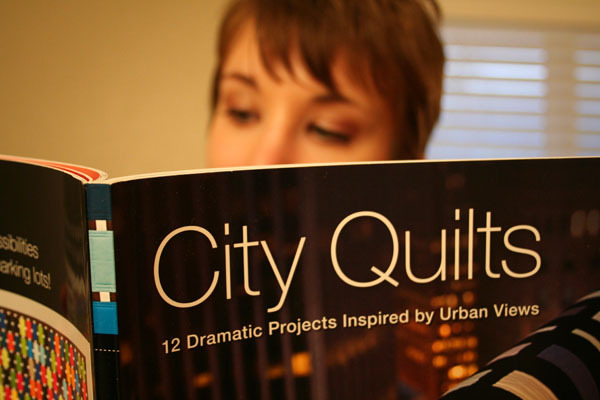 So, I feel like I know a lot about quilting — but all in theory. Every time I muster up the energy to sew, I realize how great the disconnect is between my quilting knowledge and my quilting ability. Really, the only solution is to sew, sew, sew some more, which can be difficult with how much time I spend at the shop. 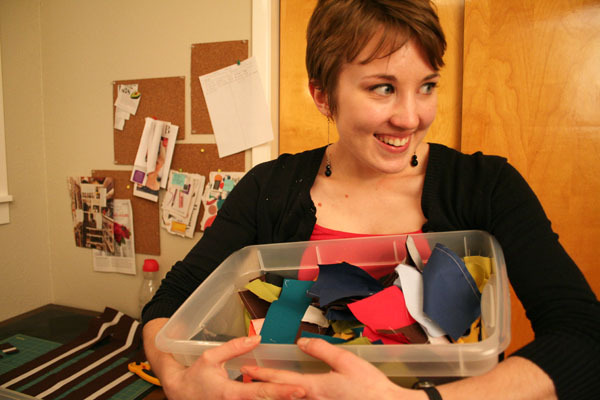 I’ve also learned that for someone with so little time to sew, small projects are key. I’m that girl that starts a million projects, but never finishes them. So my new policy is, if I’m gonna start something, I’ve gotta start small. 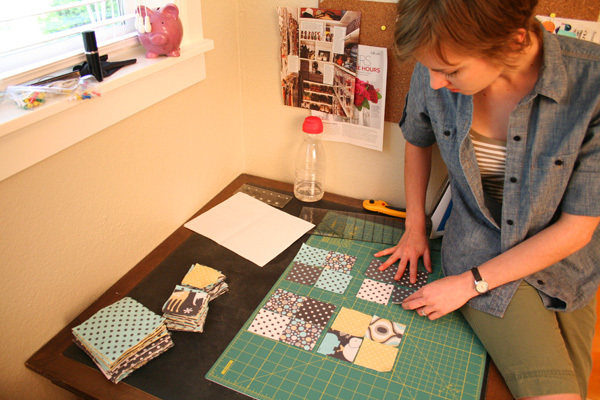 I was thinking quick and easy when I volunteered to make our next quilt kit sample, called Baby Elephant Walk. 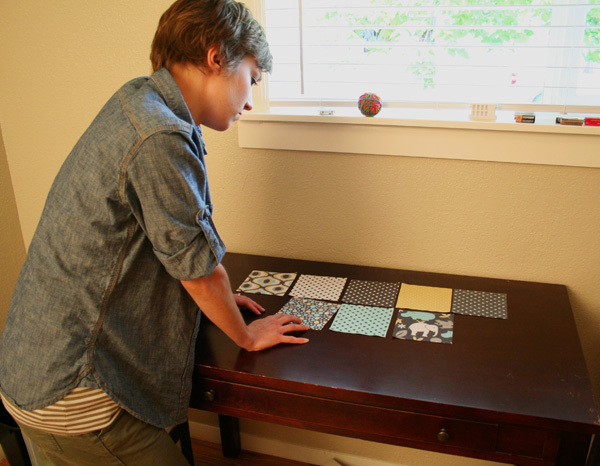 The honor of assembling our samples is often given to Della, who can easily whip up a quilt top in a day or two. Not this time. 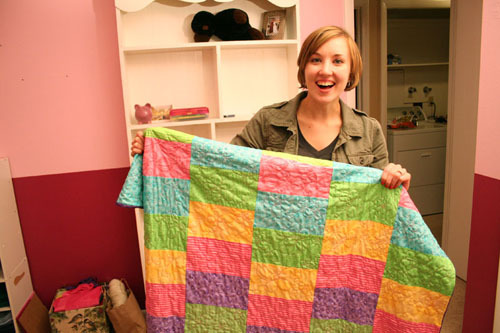 As soon as I saw the pattern — Square Dance by Bits ‘n Pieces — I knew this baby quilt was within my skill set. 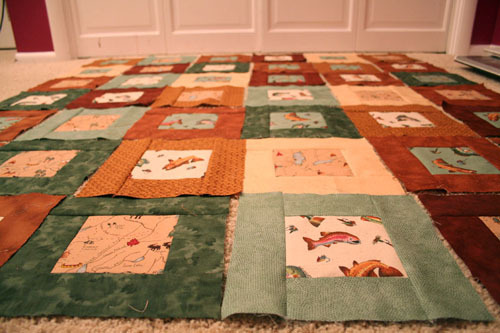 Consisting of four-patches and five-inch squares, my greatest challenge would be those dang ¼” seams. I think I’ve got ‘em down, but gosh it isn’t as reliable as those blocks that are conveniently squared-up. Did I mention the finished size is only 36″ x 45″? 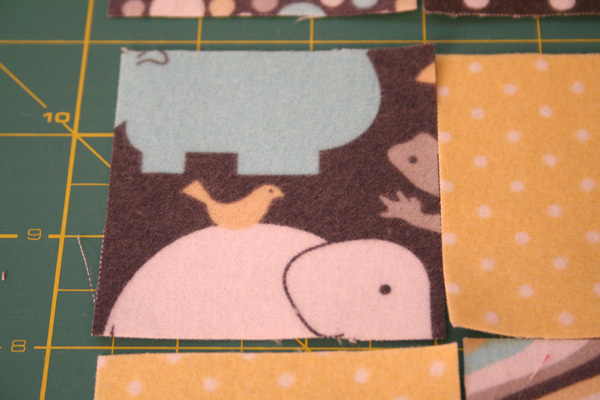 And that we’re using super-cute grey, aqua and yellow flannel with zoo animals?! I’ve got this! Even a 2-3/4" square of this fabric is adorable! First step? Cutting. Cutting is my least favorite. The pressure is definitely on as this sample has. to. be. perfect! 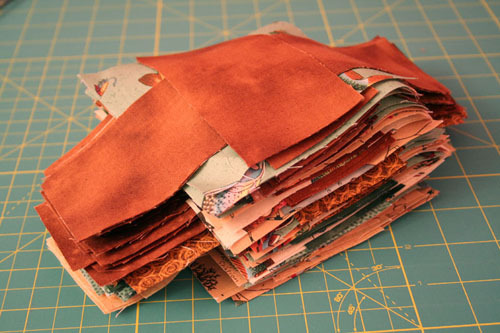 And already I’m going slower than all you quilting experts — rather than stack up 4 layers of fat quarters to cut at the same time (as the pattern suggests), I’ve kept things neat with just piles of 2. Can’t be too careful. I also learned that it’s a good idea to visualize each step of the cutting process so you don’t end up adding a step unnecessarily. For example? 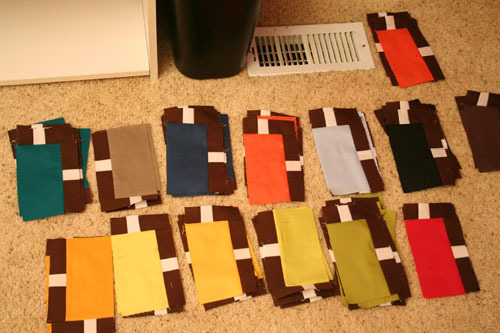 Step 1 says to cut the fat quarters into 5” x 21” strips and 2-3/4” x 21” strips. 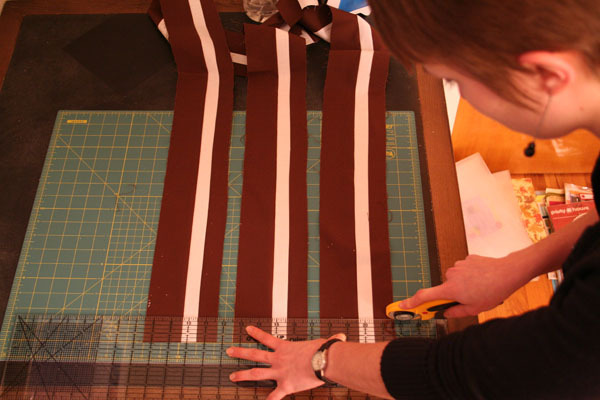 So, I made sure all my fat quarters were exactly 21” before slicing them down to 5” & 2-3/4” strips. Step 2? Cut the 5” strip into 5” squares, with an inch or so of scrap left over. I could have just left my strips longer than 21” to begin with and ended up with more scrap at the end. I’m still learning how to be efficient. After much deliberation and mock-up four patches, I think we figured out the best arrangement. Just like the pattern tells me, I’ve alternated light and dark fabrics, mixed up large-scale and small-scale prints and I’ve put my best fabrics in the middle spots. Now it’s time to sew! I did it! My seams are exactly 1/4"! Woo hoo! Here I am showing Nani how must faster it is to chain piece everything. She thinks I am so smart! 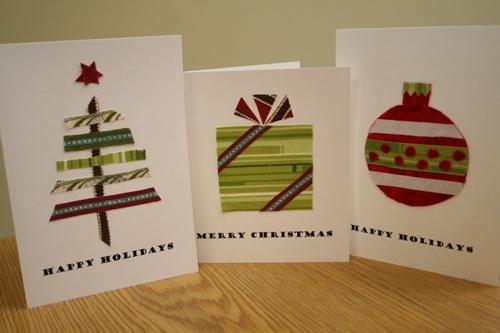 Print a holiday greeting onto a sheet of 8 ½” x 11” card stock paper. (Two per page.) Align the greetings so one is about half-way down the page, the other at the bottom, both centered in the right half of the page. 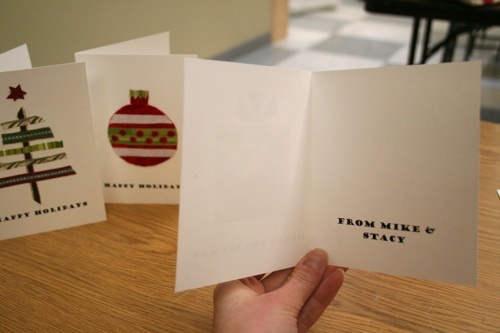 If you want a personalized message on the inner part of the card, repeat this process and carefully reinsert your sheets into the printer, making sure the message will properly print on the opposite side of the page. 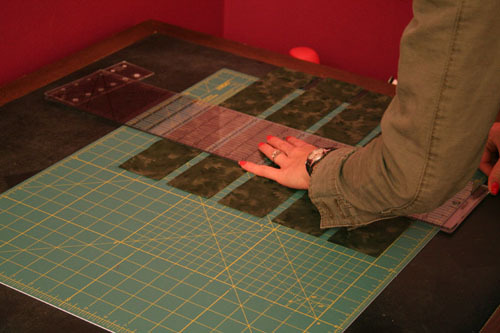 After printing, cut the sheet in half so you have two 8 ½” x 5 ½” pieces. Score the pieces with a pin on the outside so they fold in half. 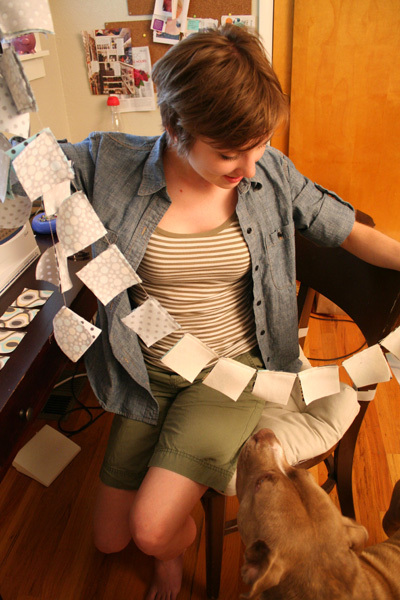 Use scraps to create a tree, heart, star — whatever you can imagine. Get creative! Glue them down with a glue stick to hold in place. 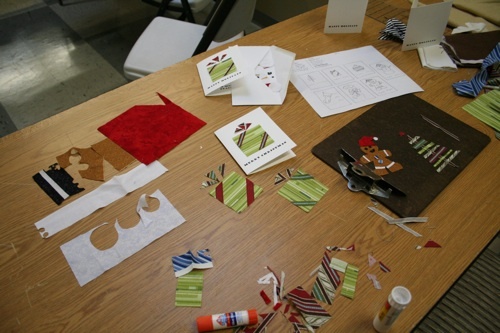 Stitching is optional for a sewer’s touch, or you can use fusible. To give these as a gift, pick up envelopes at an office supply store and bundle it all together with a ribbon! I really spread out for this project. 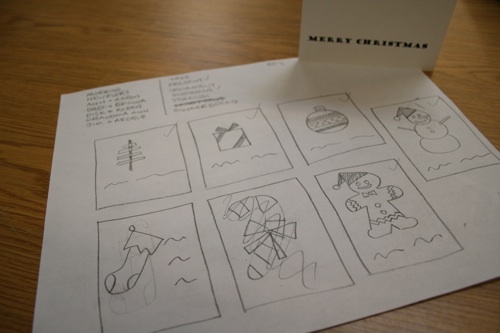 Before I even started, I put my thinking cap on and sketched some Christmas ideas. 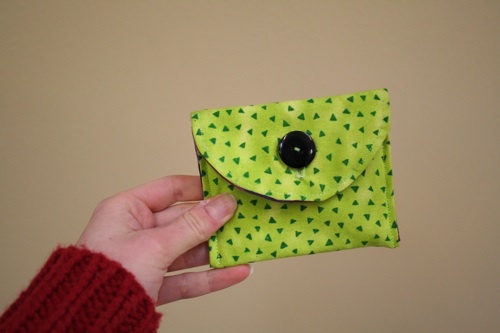 I’ve been making a ton of purse pockets for gifts this month and they’re a quick and easy way to give a cute little something to nearly anybody you know. All it takes is one or two layer cake squares and there’s a million ways to customize them and make ‘em all a little different. If you’re like me, sometimes you don’t want a big bulky wallet – you just need the bare essentials–debit card, drivers license, insurance card, and of course my coffee punch card. (Who can survive without their morning espresso?) The purse pocket looks just like a pocket, fits the essentials and I can quickly throw it in my purse or pocket. If it’s brightly colored, it’s even easier to find! If I’m really traveling light, these little wallets can even squeeze a few other items in there like chapstick or your car key. – Iron on the fusible web to the wrong side of one of your pieces. – Place your two pieces together, right sides together, and pin in a few places. 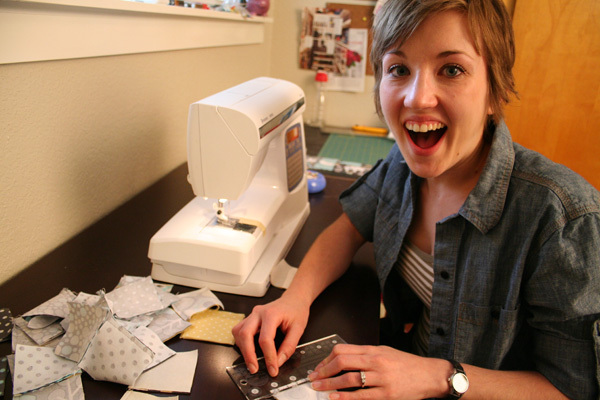 – Sew with a ¼” seam allowance all the way around, leaving a 2” hole. Beginner’s tip: make sure you sew all the way around the corners. It’s impossible to slip stitch a corner at the end. It’s best if you make your hole in the middle of the long edge. – Turn inside out and press. Slip stitch your hole. – Top stitch across one end of your pocket (the part that isn’t going to be the flap) about ⅛” from the edge. – Fold your pocket in thirds. You can play around with size here — You can decide how long you want the pocket, how far down you want the flap to go, etc. I made mine come almost all the way down to the crease so it looks very similar to a wallet. Once you’ve figured out your proportions, press your creases. – It may be easier to attach a closure of your choosing before you do the final top stitching. It can also be added on at the end. – Top stitch around the edge of the rest of the pocket. This is what holds the pocket in place. Annnd you’re finished! I used the heavy-weight fabric from the Oz line. 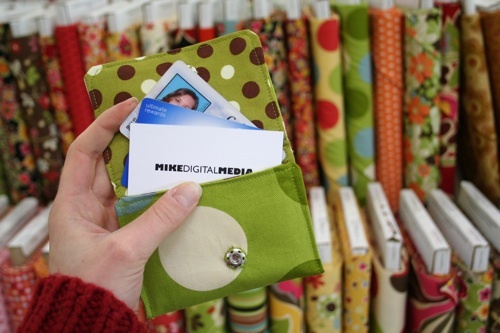 It fits all my "cards"
– Use batting to make the pocket a little fatter and squishier. 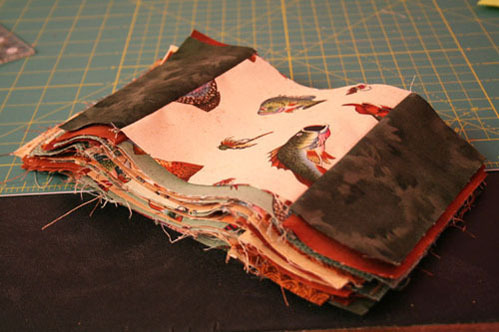 You could even quilt it-but then you’ll need to bind the edges. – Instead of making the flap of the pocket square, round it out or make it a triangle for something different. A rounded flap really makes it look like a pocket. – There are a million ways to make the closure. My first “mock up” pocket I made a button hole and used a button. It’s a little slower to get it open, but looks cute. You can sew on some velcro and still sew a button on the top flap for decoration. I prefer a snap. Fastest way to fling it open and whip out the cash! Just be careful not to use magnetic snaps — they will destroy your credit cards. 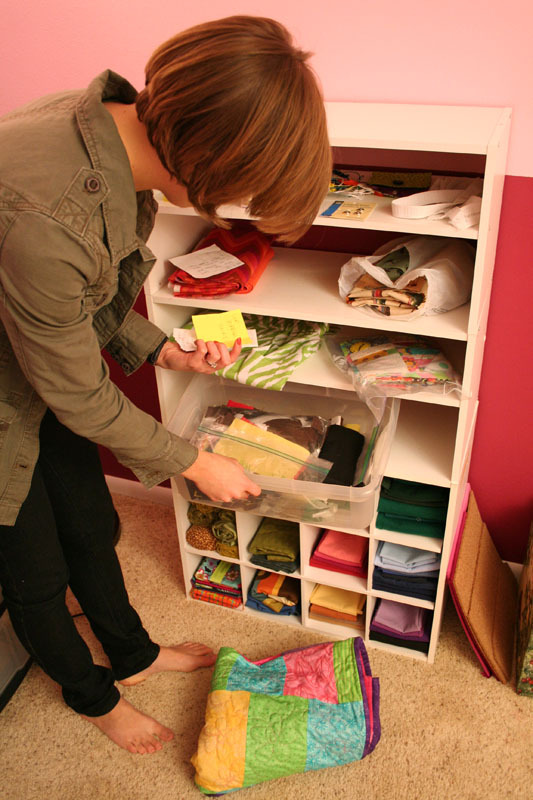 – Use home dec or mid-weight fabric to make the exterior a little tougher. 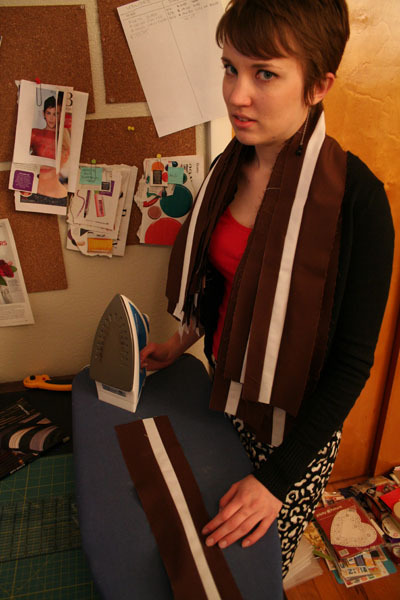 – Make the body of the pocket a little bigger and attach a strap. Now you’ve got a wristlet! Here's my mock up with a button hole. GIVEAWAY!! 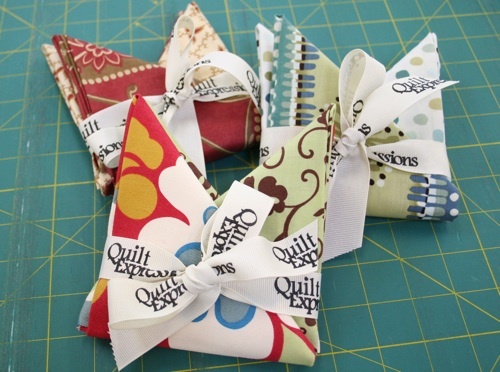 We will be giving away a total of SIX fat quarters to one lucky individual. 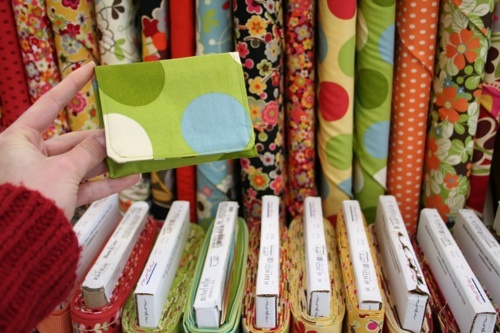 Each pair of fat quarters are perfect complimentary colors and patterns so you can make three pockets of your own. How can you win? Make a comment to this blog entry with your first name and email address and you will be entered to win. Our winner will be chosen on December 13th so don’t delay. Invite your friends to enter, too. Maybe they’ll win and make you a purse pocket for you out of the prize fabrics! Three different colorways to please all your friends!